Why Are These Big Banks Warning Us To Sell Stocks? Home » Why Are JP Morgan & RBS Warning Us To Sell Stocks On Any Rally? Why Are JP Morgan & RBS Warning Us To Sell Stocks On Any Rally? In a worrisome twist, two big banks are warning clients to get out of the stock market while they still can. Why the panic? 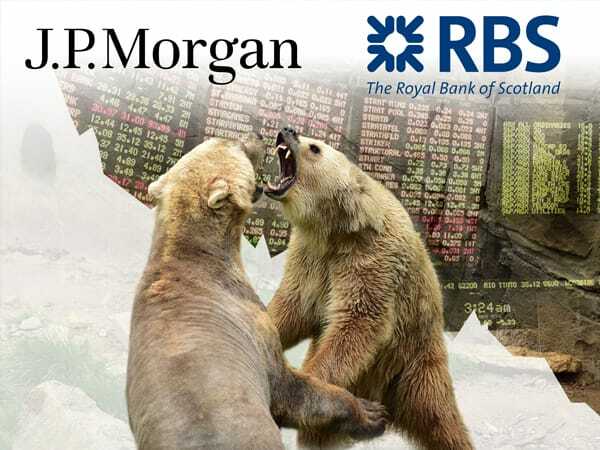 Following the worst start to a year in the stock market, Week 2 of 2016 sees the likes of the Royal Bank of Scotland (RBS) and JP Morgan issuing a simple warning to clients: Get out of the stock market ASAP! Don’t worry, we were shocked to hear them say that too. Of course, we’ve already been arguing for some time for people to get to the life boats of the Titanic and as far away from the sinking ship as possible — that is, while there are still available seats on the rafts. The RBS went further to state that 2016 would be a “cataclysmic year”. Simply put, the RBS knows that it’s only a matter of time before the market goes belly up and they don’t want to risk their clients losing everything — as many of them did during the 2008 global financial crisis that “no one could see coming”. JP Morgan has joined RBS in parroting this message that people should jump ship. This warning becomes even more interesting when you take into context the fact that JP Morgan just posted their first loss in six years with loan loss provisions, to the tune of $89 million. They themselves are feeling the pinch. If you need a reminder from the 2008 crash and how quickly the stock market can collapse, then do yourself a favor and go see the new movie, The Big Short. In it, you will see how manipulated these markets are, and how quickly a company like Bear Stearns can go to $2 a share in a matter of days, after being a whopping $159 only 365 days earlier. Or, you can see how loans rated a safe and secure AAA by respected credit rating agencies fell apart in days. If you think it can’t and won’t happen again, then we have news for you: The problems from 2008 and before have been brewing for some time. They’ve been papered over in a bid to keep this current system going. But, you know this charade is really running out of steam when the big banks who benefit from this current paradigm are TELLING YOU that the sky is about to fall. If you don’t own at least some precious metals, right now might be your best last chance to diversify your savings. Following Friday’s stock market plunge, U.S. stocks are off to their worst 10-day start to a year ever. You can still buy gold and silver. To get started, give us a call. Or, simply click here to request a free info kit on gold. In spite of all the economic trouble China is facing, they make it a priority to hoard gold, setting a new buying record in 2015. Read further here.